As always, Psych received a warm welcome at San Diego Comic-Con, packing Ballroom 20 on Thursday. The show about fake psychics but real detectives is fast approaching its 100th episode and the cast and crew are just as excited as the fans. Some of the tantalizing tidbits about season 7 of the USA Network show include an episode on internet dating, one set in Mexico, a two-part musical episode with all original music, and an episode inspired by Cirque du Soleil. Gus (Dule Hill) also gets a girlfriend this season, newcomer Parminder Nagra of ER and Bend It Like Beckham fame. But what we really want to know about is that milestone 100th episode. While most of the details are being kept under wraps we do know that the plot will be an homage to the movie Clue. Plus several cast members will be returning including Christopher Lloyd, Lesley Ann Warren, and Garrett Morris. If that wasn’t enough, fans will be happy to hear that there’s no end in sight for Psych. “We’re producers that want to make this show forever,” said Executive Producer Steve Franks in an interview. Tonight marks a pretty big night for fans of the USA Network series Psych as it finishes off another successful season. Ending the fourth season will be quite a big episode, as 80’s star Ally Sheedy reprises her role as the serial killer Mr. Yang in “Mr. Yin Presents.” The episode will also stand as a send up to many classic Alfred Hitchcock films in a half-spoof half-homage episode. We were lucky enough to talk to star James Roday and Sheedy about the episode, and they were able to give us some insight on what we can look forward to seeing. Be sure to catch the season 4 finale on USA at 10 PM EST. Clearly in this episode there is a lot of Hitchcock references. James I was wondering if there is anyone else you drew inspiration from – influences from when you were directing this episode? Roday: You know, I really do try to stay as faithful to Hitchcock as I could both aesthetically and in pacing and I just shamelessly ripped off four or five shots straight out of his films, quite frankly. It was an homage episode and I’m a Hitchcock fan, and Andy Berman who wrote the episode with me, is a Hitchcock fan. As much as we could get away with doing Hitchcock in a Psych episode that’s definitely what we set out to do. Twitter Giveaway: ‘Psych’ Finale Prize Pack! 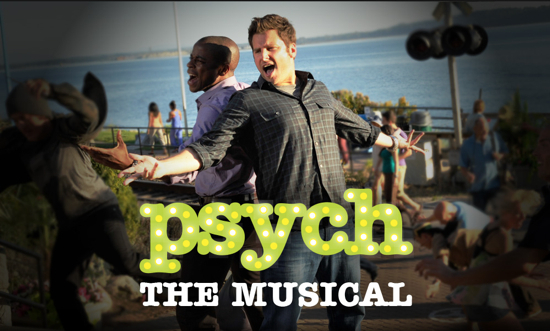 Are you a big fan of USA’s Psych, starring James Roday and Dulé Hill? Then you’re going to want to hop on over to our Twitter all day tomorrow as we host another Twitter Contest for an awesome prize pack to coincide with Wednesday night’s Psych season finale. Don’t miss the most shocking PSYCH finale ever as a killer targets Shawn using scenarios from classic Hitchcock films. Ally Sheedy guest-stars in Psych’s season finale, directed by James Roday — “Mr. Yin Presents” — premiering Wednesday at 10/9C! Be sure to check our Twitter Feed all day tomorrow to see the Psych trivia question that will give you a chance to win! Also, don’t forget to catch the season 4 finale of Psych, this Wednesday at 10pm EST!! Good Luck!